There is a new column on the Merit Badges tab in the Individual Advancement page: Applied To Rank. This column is automatically computed based on the date each merit badge was earned, taking into account the number of Eagle-required badges needed for each rank. 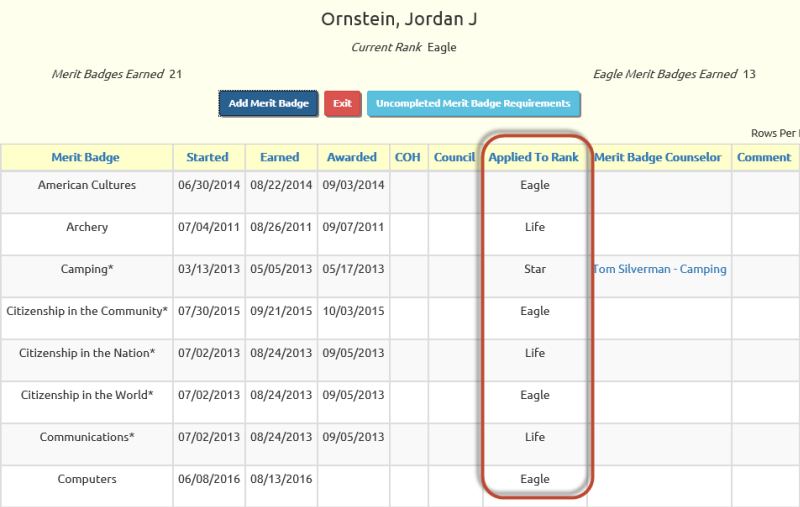 The system assigns the Eagle-required badges to each rank first. Once the necessary number of Eagle-required badges have been assigned, the rest of the badges are assigned in the order in which they were earned. If the scout does not yet have the necessary number of Eagle-required badges for a given rank, the rest of his merit badges will be left unassigned. The rank assignments are also shown in the Scouting History Report. On your Council's Internet Advancement page, you should see a link for Member Summary Export on the left menu. This page allows you to export a CSV file with all completed ranks and merit badges. This file can be uploaded to TroopWebHost using a new upload program. For details, please see our User Guide. Girl Scouts and Cub Scouts now have the ability to add shifts to an event. Shifts can be used to create multiple time slots that require staffing, such as at a fundraiser like Christmas tree sales. Shifts can also be used to allow members to sign up for different types of food for a potluck dinner. Members can sign up for shifts from the calendar, or from the new Sign Up For Upcoming Shifts page on their My Stuff menu, as shown below. You can finalize attendance at a shift with the new Take Attendance For Shifts page on the Events menu. Reports are available to list the participants and show total hours contributed by each member. Treasurers for Girl Scout troops and Cub Scout packs now have the ability to override the amount for individual members when creating a group transaction. We added a second server to our configuration this month. The new server is dedicated to serving pages for the TroopWebHost.org domain where all of our Boy Scout sites are hosted. It has an Intel Xeon E5-1650 v3 Hexa-Core processor running at 3.5 GHz, with 32GB of RAM and a pair of mirrored 256GB SSD drives. 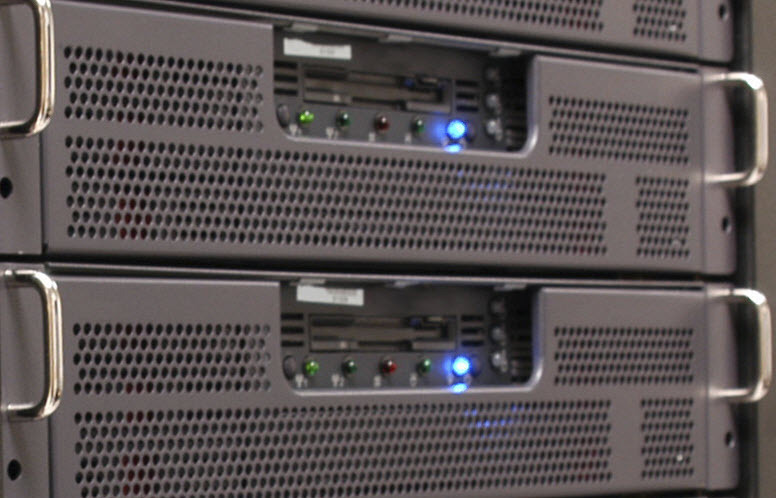 It is housed in the same rack as our first server to which it is directly linked via a dedicated switch. Our first server will continue to run SQL Server database operations for all of our sites, and will continue to host our Girl Scout and Cub Scout sites. We expect this added horsepower will improve the speed of everyone's sites and give us the capacity to support our continued growth.